Curtains are multitaskers. They block out light, heat, and cold; offer much-needed privacy; and are an important decorative finish. All good stuff. But let's be honest, purchasing them can be a bit intimidating for those of us who aren't interior designers. There's a lot to consider when approaching this seemingly innocuous design decision: Should you opt for ready-made or custom? How high should you hang them? How wide? What material do you choose? Not to mention the task of deciphering a seemingly secret language — single panel, double panel, pelmet, valance, etc. It can be overwhelming, but we are here to help. Check out these nine living room curtain ideas that illustrate how window treatments can completely transform a room. 1. Use color-blocked drapery for a playful note. Santa Monica-based interior desigenr Daleet Spector infuses plenty of pattern and texture into this Southern California home, creating a laid-back and welcoming living room. The color-blocked drapery panels — from dark to light — break up the white walls, while helping to ground the space. Slim, white track hardware means the fabric takes center stage. As with most things design-related, layering works. 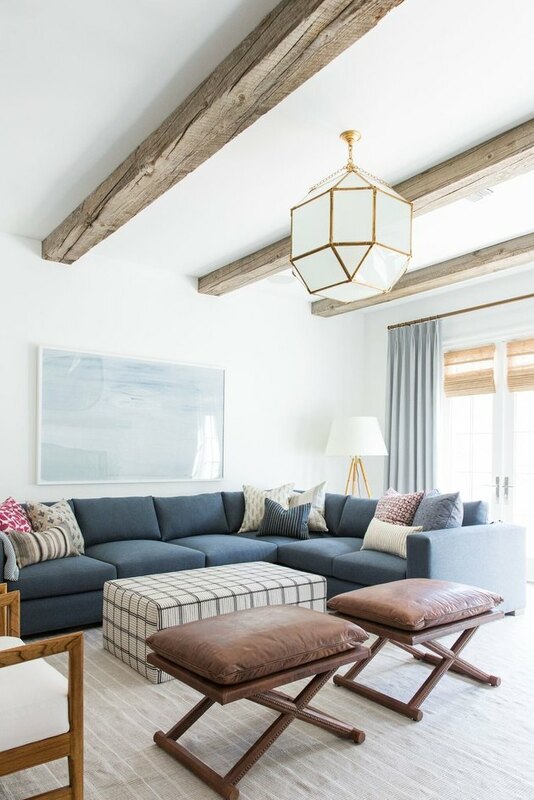 This traditional living room curtain idea by Shea from Studio McGee is a great example of how layering drapery over matchstick blinds is a winning combination — equal parts functional and decorative. And the window treatments do double duty, adding warmth and texture to the cool color palette while also filtering light. They're more of a visual commitment, but patterned curtains are a fun way to infuse personality and color into a space — as seen with this oversize leaf motif employed by the design team over at Nickey Kehoe. Here, they're paired with a neutral-hued valance (a decorative window treatment that conceals hardware) for a more formal look, and they're hung extra high. Pro tip: Spector says, "I usually hang curtain rods as high up a wall as possible because the longer the curtains, the taller and more graceful the living room will appear." 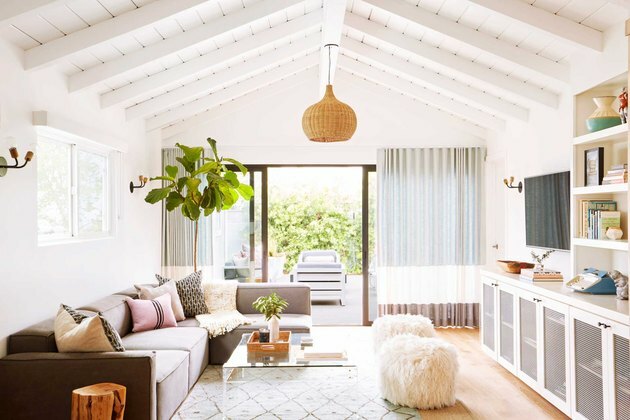 Flat Roman shades are a streamlined living room curtain idea that works well in traditional spaces such as this dreamy space designed by Katie Hackworth. The subtle pattern adds interest, but doesn't take away from the furnishings or statement ceiling fixture. And bonus: Roman shades can add softness to a room and allow plenty of light control, since they can be pulled up or lowered down. Consider mounting your shades outside of the window frame (as they are here) which makes windows appear larger, too. 5. Curtain rods are a thing. As if choosing your fabric and style wasn't enough, considering the curtain rod is also important. Here, Emily Henderson uses French or return rods, which wrap around and curve into the wall. (As opposed to regular rods which are supported by braces and finials.) They are a refined hardware option that isn't distracting to the eye. Pro tip: "I believe every room should have at least a tiny bit of black to add contrast. Black metal curtain rods are a great way to add black to a living room, dressing the space up, and adding visual contrast," said Spector. What are roller shades? We're glad you asked. A roller shade is a large rectangular swath of material that is rolled onto a metal dowel or wooden tube and attached to your window with metal brackets. They're a great alternative living room curtain idea if you're looking for a window covering that doesn't take up a lot of visual space. 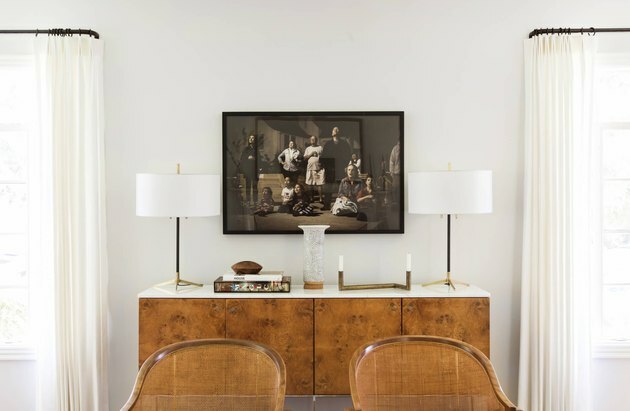 They work beautifully in minimal and modern interiors where clean lines are emphasized because they can be pulled all the way up and out of sight — similar to flat Roman shades. Designer Elizabeth Roberts uses subtly patterned woven roller shades in this apartment, which add texture and interest without overwhelming the space. Some people shy away from bold colors for curtains, fearing they'll take over a room. Surprisingly, jewel tones can function as a neutral and work as a beautiful backdrop, as they do in this living room designed by Amber Lewis. The linen drapery complements the formal-yet-comfortable space and allows plenty of light to filter in. And note the French rods here! Pro tip: "If you are going for a dressy living room, use a more formal fabric like velvet or silk and add trim to the edges. 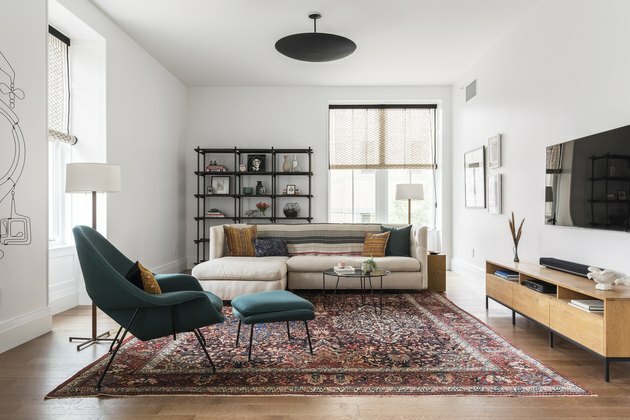 If your living room is more casual, then linen is always a great choice — it's still sophisticated and special without being stuffy," adds Spector. 8. Match your curtains and walls. For an elegant living room curtain idea, match your drapery to your wall color. This is a great option if you want your window treatments to "disappear," allowing other elements in the room to take center stage. 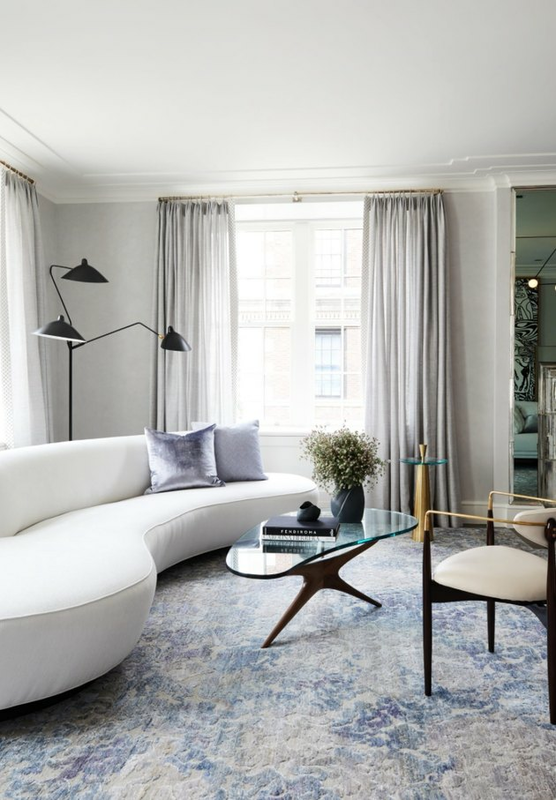 In this Manhattan apartment designed by Ronen Lev, the curtains are the perfect backdrop to curved furniture and a patterned rug. Brass accents add a touch of glam. 9. Or, you can skip curtains altogether. If you're still not convinced that curtains are for you, then you'll be happy to know that, yes, you can forgo them and still create a beautifully curated and finished space, as designer Martha Mulholland achieves in this living room. 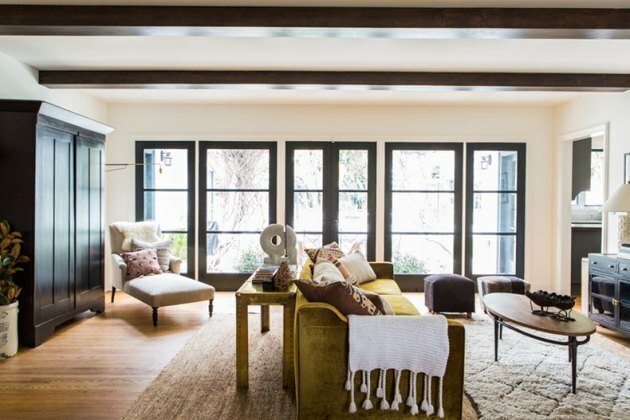 In lieu of any window treatments, she uses the French doors as a design element by painting the trim and mullions an eye-catching deep brown. This contrast really draws the eye and grounds the space. How Long Should a Valance Be?